The Northern Ireland Civil Rights Association (NICRA), in an effort to avoid a repeat of the violence at Milligan Strand on 22 January 1972, placed “special emphasis on the necessity for a peaceful incident-free day” at the next NICRA march on 30 January 1972 (Irish News, 28 January 1972). 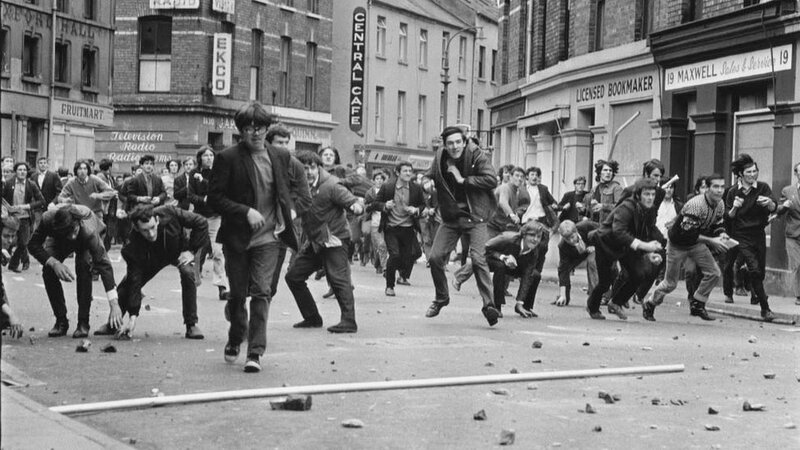 In the run up to the first anniversary of ‘Bloody Sunday’ there was serious rioting in Derry. James Prior, then Secretary of State for Northern Ireland, said that the DeLorean Motor Company would not be offered any further public funding. He also announced that Kenneth Cork would be appointed to examine the whole DeLorean affair. The government in the Republic of Ireland announced that it would introduce legislation to give full voting rights to approximately 20,000 British citizens. The appeal of the ‘Birmingham Six’, the six men imprisoned for the Birmingham pub bombings of 1974, was rejected by the London Court of Appeal. Fresh evidence, particularly the fact that the original forensic tests were flawed, was rejected by the appeal judges. An Irish Republican Army (IRA) incendiary device exploded in a store in Oxford Street, London. A second device was defused. A Royal Ulster Constabulary (RUC) Landrover patrol was attacked on the Springfield Road, Belfast. Two ‘rockets’ were fired at the patrol but there were no injuries. Michael Mansfield, then a Queen’s Council, claimed that the escape by IRA prisoners from Whitemoor Prison in England on March 1995 was assisted by British Intelligence involvement in an attempt to “scupper” the then IRA ceasefire. Third day of multi-party talks at Lancaster House in London. Marjorie (Mo) Mowlam, then Secretary of State for Northern Ireland, said that a face-to-face meeting between the Ulster Unionist Party (UUP) and Sinn Féin (SF) would be a useful development. Gerry Adams, then President of SF, sent a letter to David Trimble, then leader of the UUP, requesting a meeting between SF and the UUP. There was a pipe-bomb attack on the home of a Catholic family in Dungannon, County Tyrone. The family had a narrow escape when the bomb was thrown through the kitchen window. The Royal Ulster Constabulary (RUC) announced that it would hold an inquiry into the alleged file used by Ian Paisley, then leader of the Democratic Unionist Party (DUP), in the House of Commons on 27 January 1999. The Northern Ireland Policing Board (NIPB) held a meeting with relatives of the victims of the Omagh Bombing (15 August 1998). The meeting followed the report (12 December 2001) of Nuala O’Loan, then Police Ombudsman for Northern Ireland (PONI), into the police handling of the investigation and the response (24 January 2002) by Ronnie Flanagan, then Chief Constable of the Police Service of Northern Ireland (PSNI). A new court building opened in Belfast. The building houses 16 Crown and County courtrooms. The £30m building was built under a public-private partnership scheme and will be operated by the company Consul Services (NI) Ltd., under a 25 year agreement. The Ulster Political Research Group (UPRG) called on the British government to launch a formal review of the Good Friday Agreement. The UPRG said the initiative was required due to the declining support among many Protestants for the Agreement. Off duty. Shot at garage, Oldpark Road, Belfast. Killed in grenade attack on stationary Royal Ulster Constabulary (RUC) mobile patrol, Sion Mills, County Tyrone. Killed by remote controlled bomb hidden in city walls, aimed at British Army (BA) / Royal Ulster Constabulary (RUC) observation patrol, while watching the nearby Bloody Sunday commemoration parade, Westland Street, Derry. He was hit by flying debris. Killed by booby trap bomb attached to door at house he was renovating, Drum Road, Kildress, near Cookstown, County Tyrone. Owner of the house was the intended target.